'Boring' Singapore City Photo: Are You Being Served? If you have been surfing websites in Singapore, you would probably have noticed advertisements for "Are You Being Served?" by the GEMS (Go The Extra Mile for Service) folks. Have you visited their site and see how some others have completed their 'mission'? I have been asked to come up with a mission and try it out. Two weeks ago, a colleague had a phone call from a bank that she had earlier applied a credit card. The bank officer asked her for her payslip for the 2nd time. It seems they have misplaced it and needed her to send in again. They said they will send a courier over again to pick it up. But if you know couriers, they always tell you they will be there between 2-5 pm. You can't expect people to sit around and wait when you have so many meetings to attend. So she told them she does not want the card anymore. It was a long conversation with the bank apologizing etc, but my colleague had enough. She does not want a card from an incompetent bank. So my mission is based on her experience. I am applying a card from a different bank from the one my colleague applied from. The bank that I am going to apply a card promises a card within the same day on their website. Let's see if they can do it. Will I have to wait a week for it to be processed? How many credit cards do you carry in your wallet? 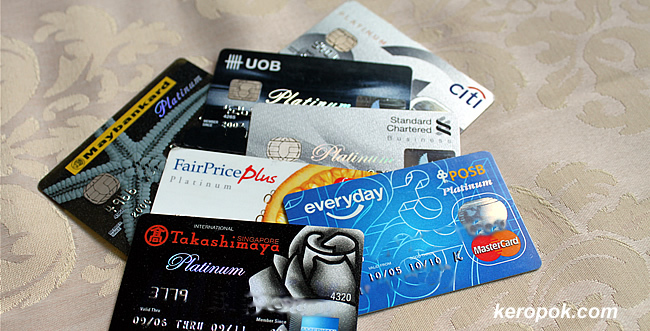 It seems that most people apply credit cards in Singapore for the benefits that comes with it. Like the rebates you get or the discounts at restaurants or shops. My brother in law in the UK says credit cards do not have such perks there. (Is it true if you are in UK?) I know credit cards in Malaysia, Indonesia, HK enjoy such perks too, thus people in these countries probably carry multiple cards in their wallet!